By Jim Dower: In a rather listless sloppily fought bout, unbeaten light heavyweight prospect Luis Garcia (12-0, 9 Ko’s) did what he had to do in winning an eight round unanimous decision over Alexander Johnson (12-1, 5 KO’s) on Friday night on the undercard of the Jermain Taylor vs. Jessie Nicklow fight card in Cabazon, California. The final judges’ scores were 80-71, 80-72 an 80-72. Making his first appearance since his win over Arthur Abraham in the Super Six tournament last year, Andre Dirrell (20-1, 14 KO’s) overwhelmed a badly overmatched Darryl Cunningham (24-3, 10 KO’s) with speed and power shots en route to knocking him down two times and stopping him in the 2nd round. It was a very strange fight. Dirrell landed a tremendous left hand at the start of the 2nd that clearly hurt Cunningham and caused him to grab a hold of Dirrell. 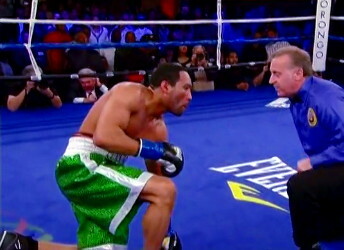 The referee then pulled Cunningham off of Dirrell and asked him if he was okay. Cunningham nodded his head to indicate that he was okay but clearly wasn’t, because when the action resumed, Dirrell dropped Cunningham with a scorching left hand to the head. While Cunningham was down, his corner threw in the towel. However, when the referee asked them if they were throwing in the towel, no one fessed up. When the action resumed, Dirrell knocked Cunningham down with a short right hand when the two were almost in a clinch. This time the fight was stopped when Cunningham’s corner threw in the towel for a second time. Kelly Pavlik is probably kicking himself right now for having backed out of a fight with Cunningham earlier this year. Dirrell looked like he’d never been away, as his hand speed was simply amazing and left hand shots were devastating. The fight was officially halted at 2:06 of the second round. Dirrell put a lot more power in his shots than he usually does and appeared to be fighting a lot like his younger brother Anthony Dirrell, who is making a name for himself with his power punching. Moments ago, former WBC/WBO middleweight champion Jermain Taylor (29-4-1, 17 KO’s) stopped Jessie Nicklow (22-3-3, 8 KO’s) in the 8th round with a flurry of punches to the head. Taylor fought reasonably well, throwing mostly jabs during the fight. He seemed concerned with gassing out and/or getting hurt because he never really opened like he used to do earlier his career before he started experiencing stamina problems. Taylor looked to be in excellent shape and was a lot taller than this guy. Taylor was connecting with his shots but fighting too conservatively. He lost a point for hitting Nicklow late after the 6th had ended. It looked like a retaliation move by Taylor to pay Nicklow back for hitting on the break. It was hardly necessary because Taylor was dominating the fight and Nicklow didn’t have a prayer. Overall, a decent performance from Taylor but not one to make you think he’s back completely. He looked like the same fighter that was stopped by Arthur Abraham two years ago, as he fought the same way for the most part with his jabbing. The difference here is that Nicklow had no power or size to give Taylor any problems.